BrickCon 2009 has begun... it's fun to read that in an ominous voice... (insert ominous voice here, a la beginning of Laser Tag session or Mortal Kombat announcer). 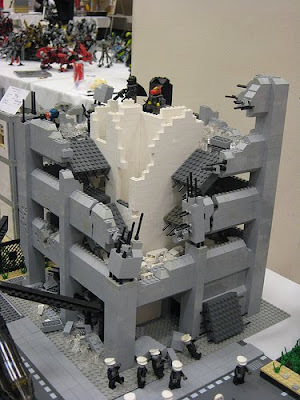 The annual adult fan of LEGO convention in Seattle last year was the first convention that I brought something I'd built. The buzz on a convention prep day is perhaps the best of the entire weekend (sans the moment when The LEGO Group reveals a new set for the first time). People start arriving from around the world. As LEGO User Groups and solitary fans wheel in container after container of what they've built on handtrucks or in hands. It is a visual tailgate, where your mind gets overstuffed on the creativity of your fellow convention participants. It also marks a transition point. The convention is still private, but the public viewing days will begin tomorrow. And then comes the appreciation, frustration, and solid mass of people experiencing the joy of seeing just how much you can do with a few bricks and some imagination. To those of you battling zombies in the LEGO Apocafest or building viper recreations from Battlestar Galactica, I offer you the same wish -- good hunting.